Sleek and shining on a refined silky nylon cord. Trendy and twinkling on a lustrous triple-chain necklace. Whichever way you wear it, this posh pendant from Hollywood darling Nolan Miller is ever-elegant. Finished in silvertone, signed and features genuine Swarovski crystals. Beautiful Nolan Miller necklace featuring goldtone satin textured 12mm beads with tiny high polished beads in between. It can also be worn as a round necklace or pull the clasp to the front and forn a V shape. NECKLACE HAS THE LOOK OF WHITE DIAMONDS SET IN WHITE GOLD. 17" IN LENGTH. THIS IS YOUR OPPORTUNITY TO GET BEAUTIFUL NEW OR LIKE NEW JEWELRY TO DRESS UP YOUR OUTFITS. YOU WILL FEEL LIKE A PRINCESS OR MOVIE STAR WITH THIS JEWELRY ON. Beautiful Nolan Miller goldtone drop pendant featuring three flowers, graduating in size-all with tiny white seed pearl floral centers and accented with clear crystals. This pendant is in new unworn condition. In excellent unworn condition. Estate jewelry. New Nolan Miller Designer Of The Stars. 'Glamour Collection'. Circle 'Eternity' Pendant Necklace. Brilliant Silvertone 3 Strand, Oval Link Chain Necklace. USE THE 'ZOOM' FEATURE TO TAKE A CLOSE LOOK. "NOLAN MILLER GLAMOUR COLLECTION" BEAUTIFUL CRYSTAL BUTTERFLY NECKLACE GORGEOUS! Nolan Miller recently passed away in June 2012 and he will be missed. Nolan Miller was 10 years old when he decided that he wanted to be a fashion designer. He moved from rural Texas to Los Angeles to study fashion at the Choinard Art Institute. "NOLAN MILLER GLAMOUR NOTABLE NAVETTE PENDANT" SPECTACULAR!!! GOOD CONDITION, SIGNED NOLAN MILLER. CLASSY, SMOOTH LINK CHAIN NECKLACE WITH FANCY TOGGLE CLASP. SPARKLY CRYSTAL CLASP WITH LIGHT BLUE FAUX GEMS PROTRUSIONS ON THE ENDS. SEE PICTURES. For MOM and all Nolan Miller Lovers. This is the place to be for Nolan Miller Jewelry. Heart Slider in Goldtone and Austrian Crystal. Legend NOLAN MILLER - designer of "The Stars". Heart Pendant SLIDER Neclace by. NOLAN MILLER Gracious Heart Pendant Silver Clear Crystal Rhinestone Necklace. Shipped with USPS First Class Package. The Place to be for Nolan Miller Jewelry. Legend Designer NOLAN MILLER. Polished Goldtone, Rhodium coated for lasting shine. Great Career Wedding Evening Dressy Necklace. Darling Floral Pendant Necklace by. NOLAN MILLER 30" CHAIN PENDANT WITH AN ENCRUSTED PURSE LIKE DESIGN IN CLEAR & GREEN CRYSTALS". IN ORIGINAL NOLAN MILLER BOX WITH WARRANTY. SPARKLE - SPARKLE- SPARKLE! THIS IS YOUR OPPORTUNITY TO GET BEAUTIFUL NEW OR LIKE NEW JEWELRY TO DRESS UP YOUR OUTFITS. The Place to be for Nolan Miller Jewelry. Legend Designer NOLAN MILLER. Soo Feminine, Soo glamorous. Necklace by. Polished 14K EP Gold. Great Career Wedding Evening Dressy Necklace. NEW - Great Gift. This was QVC item J8299. "Unforgettable. Create a lasting impression with this oval pendant. From the Nolan Miller Glamour Collection. Silvertone, Chain secures with a lobster claw clasp. Includes pendant and chain. The Place to be for Nolan Miller Jewelry. Polished Goldtone 25. Elegant Clear Sim Diamond Crystal Y Pendant, Triple Chain Necklace by. New in Gift Box or. and there will be no more new Glamour Collection. He was born on January 8, 1935 in Burkburnett, Texas. In the early 90th the project Dynasty was closed, but the work of Nolan Miller in the movie was not over. Nolan Miller Orchid Necklace - Silver Tone with Crystals This gorgeous necklace was designed by Nolan Miller. This would make a fabulous gift for Nolan Miller Jewelry Lovers. Legend NOLAN MILLER - designer of "The Stars". Such a Beautiful Delicate Necklace by. with Silver Plated Setting and Chain. The chain is 17" long and the pendant hangs 1 1/2". Gorgeous Nolan Miller necklace in very good condition. Total Length 19.5", Pendant Length 3", Width 1". 100% Authentic. Gorgeous Nolan Miller necklace in excellent condition. Total Length 19", Pendant Length 2", Width 2". 100% Authentic. Stamped : Nolan Miller. I have lots. 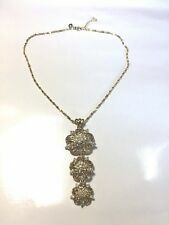 Nolan Miller Crystal Wedding Necklace 16" 3" ext. Finished in gold tone signed. Genuine Swarovski crystals. Finished in silvertone and signed. Features a genuine Swarovski crystal. This is the place to be for Nolan Miller Jewelry. Legend Designer NOLAN MILLER. Choker Necklace by. with woven leather. Treat yourself and put this in your designer jewelry collection. Shiny Polished Silver Plated, Rhodium Coated for lasting shine. The Place to be for Nolan Miller Jewelry. Legend Designer NOLAN MILLER. Polished Goldtone. Brilliant Pendant Necklace by. Chain is 28" and holds the ball. Round Pendant is covered in Sim Diamond Austrian Crystals on the front and back is open work design. This is the Place for Nolan Miller Jewelry. NOLAN MILLER - designer of "The Stars". Great Gift for Nolan Miller lovers. Brilliance and Sparkle Clear Swarovski Crystals Circle Pendant. NECKLACE by. 19" Chain with Toggle. The Place to be for Nolan Miller Jewelry. Legend Designer NOLAN MILLER. Faceted Tear Drop Pendant is Sim Diamond Austrian Crystal. Polished Goldtone, Rhodium coated for lasting shine. Simple yet Elegant Drop Pendant Necklace by. The place to be for Nolan Miller Jewelry. NOLAN MILLER - designer of "The Stars". AN ELEGANT CHOKER NECKLACE by. Choker is 15 1/2" long with a 2" extender. New in Box - Great Gift. Stunning Necklace would make a Fab Gift for any Nolan Miller lover. The Place to be for Nolan Miller Jewelry. Legend Designer NOLAN MILLER. Polished Silvertone. with Clear Sim Diamond Pave and Bezel Set Austrian Crystals. DAZZLING NOLAN MILLER GOLD TONE BLUE CRYSTAL ICE RHINESTONE PENDANT SNAKE CHAIN NECKLACE IN ORIG BOX. Signed Nolan Miller. Dazzling Stunning Brilliant Striking. Snake chain. Triangular blue crystal is surrounded with ice rhinestones on slider pendant. The Place to be for Nolan Miller Jewelry. Legend Designer NOLAN MILLER. Polished Goldtone. Necklace is A Lighter Green Faux Pearl. Big Removable Tear Drop Pendant of Faceted Green Austrian Crystal. Brilliant Pendant Necklace by. Nolan Miller Necklace Swarovski Crystal & Gray Pearl Silver 16 1/2" to 18"
This is a beautiful, Nolan Miller Necklace Swarovski Crystal & Gray Pearl Silver 16 1/2" to 18". The pearls are approx 1/4" wide. This is a beautiful necklace and would be beautiful on any outfit! This necklace is in Excellent Pre-Owned Condition! Finished in silvertone/goldtone, signed and features genuine Swarovski crystals.